The temporal lobe functions as one of the four main regions of the brain found within the cerebral cortex, and it is responsible for things like speech, memory, and facial recognition. Along with three other lobes – the occipital lobe, the frontal lobe, and the parietal lobe – it makes up the cerebrum. 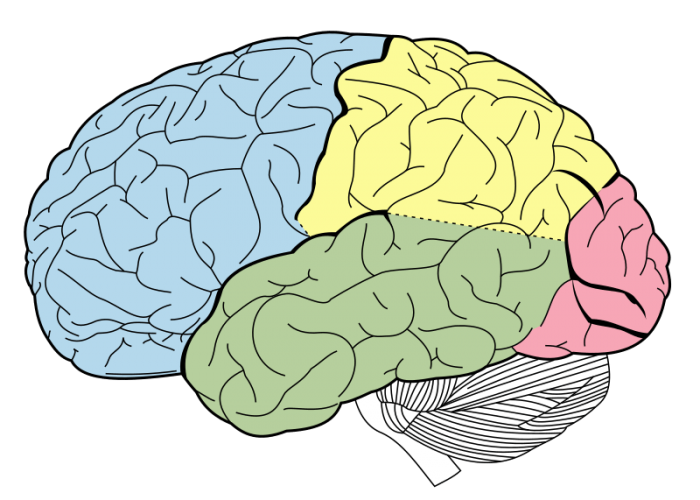 Just like these three other lobes, there is one temporal lobe found within each hemisphere of the brain, so the brain actually has two temporal lobes. The temporal lobes are responsible for complex things like perceiving audio, producing speech, managing memories and organizing sensory input. The various structures found within the temporal lobes enable this, such as the amygdala, the hippocampus, and other parts of the limbic system. The primary functions of the temporal lobe include facial recognition, language comprehension, speech, memory, auditory perception, emotional responses, and visual perception. The parts of the temporal lobe that are involved in regulating emotions are those that constitute the limbic system. The amygdala is a section of the brain primarily involved in the processing of fear and handling the associated responses. The “fight or flight” response is handled by the amygdala. There are two amygdalae, one in each hemisphere, as you might have guessed. The amygdala is roughly almond-shaped, and in addition to processing emotions like anger and fear, it also plays a role in deciding which memory is will be stored and where they will be stored. Studies done on the amygdala found that there is a collection of neurons likely involved in the fear conditioning within the medulla, which is the process of learning by association through recurring exposure to a fear stimulus. Unpleasant or distressing events combined with sights, sounds, and smells will create a link between the two concepts and the stimuli themselves will begin to evoke feelings of unpleasantness. The amygdala couldn’t do its job without the sensory information provided to it by the thalamus and surrounding regions. The thalamus consists of a dual chunk of gray matter that sits right under the cerebral cortex. The system is involved in both motor functions as well as the perception of stimuli coming in through our senses. The thalamus is responsible for regulating states of consciousness, the transition from wakefulness to sleep. When asleep, the thalamus suppresses the perception of sensory information. 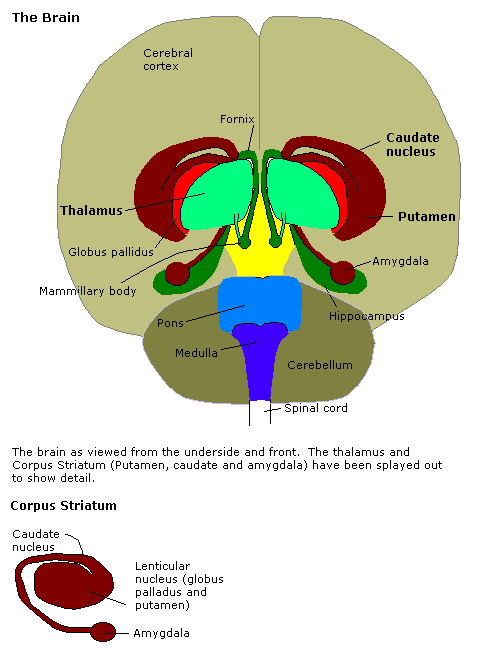 The thalamus contains a number of connections with the spinal cord and the hippocampus. Input from the spinal cord lets the thalamus get information from the peripheral nervous system and other areas. A nearby limbic system structure called the hippocampus is involved in the linking of sense to emotions and in the formation of memories. The hippocampus is a horseshoe shape and a section of nerve fibers connects the two halves of the hippocampus found within the right and left hemispheres of the brain. The hippocampus sends memories off to the correct part of the cerebral hemisphere for the purpose of storage and then retrieves those memories when they are needed. This means that it functions as a memory indexer. The two gyri, or folds, found within the hippocampal region include the Ammon’s horn and the dentate gyrus. The dentate gyrus is the way neurogenesis happens within the adult brain while the Ammon’s horn, or hippocampus major, is where information is received from other brain regions and then processed. The temporal lobe is also home to the olfactory cortex. The olfactory cortex is involved with the processing of sensory information, including handling information obtained through our sense of smell. As the name implies, the olfactory system is primarily responsible for handling our sense of smell. Once the sensory organs detects olfactory stimuli the impulses are sent to the olfactory system to be processed. Smells are frequently linked with memories, and the olfactory cortex has connections with the hippocampus, responsible for the processing of memories. The olfactory cortex is also connected to the hypothalamus and the amygdala. The temporal lobe plays an important role in the processing of auditory stimuli and in the perceiving of sound. These two functions are necessary for both speech and comprehension of language. A region of the brain that exists in the left temporal lobe and is referred to as Wernicke’s Area/Wernicke’s region helps with the understanding of speech. 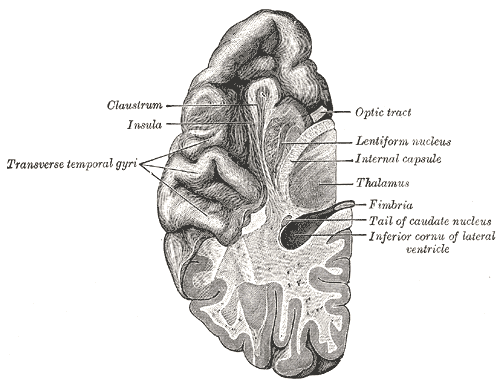 Wernicke’s area is found within the left temporal lobe, just behind the primary auditory complex. It is connected to a region of the brain called Broca’s area by a number of nerve fibers clumped together to form a connecting structure called the arcuate fascilicus. While Wernicke’s area helps process and understand language, Broca’s area is involved in the generation of speech (note that Broca’s area is not in the temporal lobe, it is found within the left frontal lobe). Damage to the temporal lobes can create many debilitating conditions. If a stroke or a seizure occurs and damage to the temporal lobe happens, as a result, an individual’s ability to speak or parse language can be negatively impacted. Such individuals may have problems perceiving or processing certain sounds. Temporal lobe damage can also lead to various moods disorders like anxiety. Other problems associated with temporal lobe damage include aggressive outbursts, hallucinations, and problems forming memories. In rare cases, people with temporal lobe damage can develop Capgrass Delusion, which refers to a belief that the individual’s loved ones are not their genuine loves ones but impostors. The other lobes of the brain include the parietal lobe, the frontal lobe, and the occipital lobe. The parietal lobe is primarily involved in the collection of sensory information and the processing of that information. A structure involved with the sensation of touch, the somatosensory cortex is found in the parietal lobe. The frontal lobes are associated with decision-making, planning, problem-solving, and movement. The occipital lobes are primarily involved with processing visual stimuli.